Tough Guy Automatic Waterer by RPI -- 1 gal.. $37.99. I have 4 of these, one for my dogs and 3 for my horses. They work very well and are easy to install. I had one unit that had a rubber seal missing for the drain. I called the manufacturer and was impressed by their customer service. Not only did they send me extra seals, but they also sent me a couple of float valves. You just don't find this kind of customer care in many companies now days. I would recommend this waterer. I had no leakage problems. The only thing to make it better would have been full of Ben Franklins. The setup was quick. Took me 30 mins. Had it a month. Working good. Poorly constructed, all plastic fittings, leaked at fittings and when tighten enough to stop leaks, fittings failed. Would not recommend. This is a cheaply made product. The threads in the drain stripped on the first day. There is no way to contact the manufacturer. They appear to have gone out of business. Tough Guy Automatic Waterer by RPI -- 1 gal. NOTE: Waterer capacity is 1.5 gallons, however the valve will only adjust to allow a fill level of one gallon. The Tough Guy automatic float waterer connects to your garden hose and provides consistent fresh water to your dogs at all times. Fence or wall mountable. 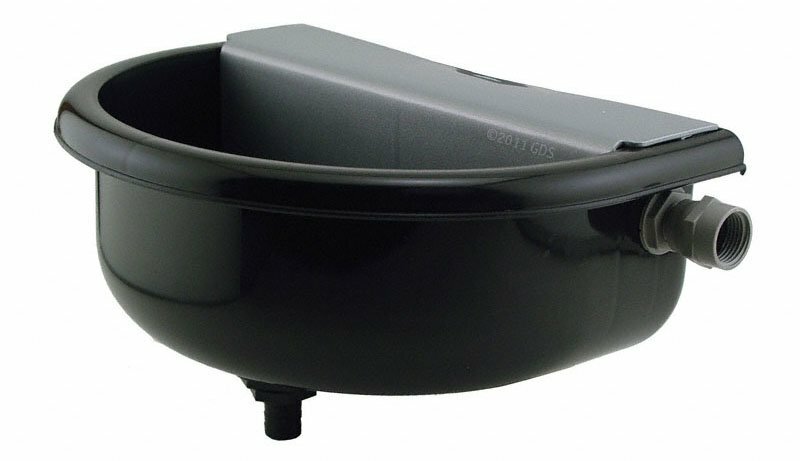 Easy to clean -- just twist the large drain plug to empty old waste water. Add a drain hose to direct the used water away from the drinking area. It's rust proof, durable, cleans quickly, and is sun resistant. Will not overflow, and no training is required. Attaches to a standard outdoor spigot with a standard garden hose. If you need a short hose or you have a problem with your dog chewing the hose, try a metal washing machine line with a female to male adapter. This should be available at your local home improvement store.